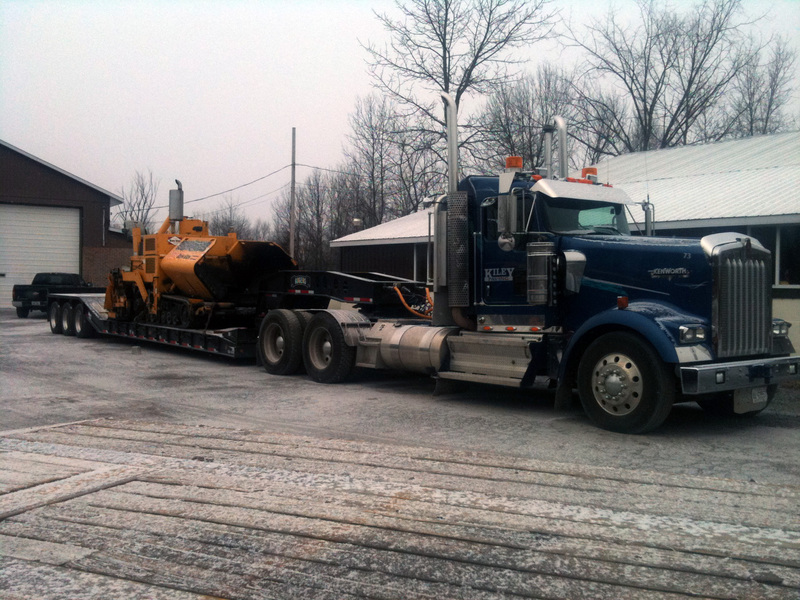 Albion, PA —Jim and Steve Kiley, owners of Kiley Paving Ltd. in Kingston, Ontario, knew exactly what they wanted when it was time to buy a new low-boy float to haul their paving equipment. Jim’s more than 40 years of experience had taught him that they needed a high-quality float that could stand up to frequent use hauling excavators, asphalt pavers, bulldozers and heavy rollers. A float that would carry more than one piece of equipment per trip would save considerable time and money. They also needed a gradual ramp to make loading the equipment safer and easier. After checking out several local dealers, Jim went to Warren Smith at Industrial Trailer Supply Company of King City, Ontario, a ROGERS dealer for more than 45 years, where he found a float that fulfilled all of their requirements. Warren suggested a 55-ton Gentle Riser, the hallmark of Rogers Blacktop Series trailers. This Rogers® 55-ton Gentle Riser is built to handle the rugged conditions encountered in road paving.